It is not quite Fall here yet (think 90 degrees) but I am definitely in the mood for pumpkin treats! One of my new favorite spreads is Biscoff. I don’t know how I went so long without it but I’m not giving it up now that I’ve found it. When I started thinking about what kind of cookies or cupcakes I wanted to make to kick off pumpkin season (that’s a season right? ), I immediately thought of combining Biscoff with it. My favorite pumpkin cookies are ones I made from a Martha Stewart recipe so I tweaked that some to make these. My nephew is a huge fan of my Snickerdoodles cookies so I was anxious for him to try them. I left only four for him and his sister to try after I sent the rest to a benefit fundraiser. He was insistent I make more immediately. 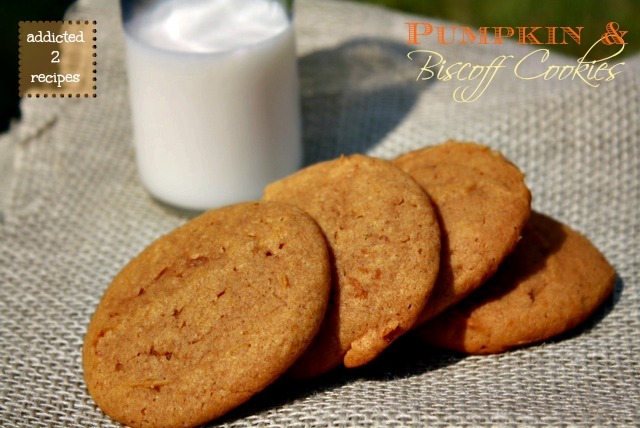 These cookies are very soft which everyone in the family loved, plus the Biscoff and pumpkin complement each other nicely. I can’t wait to make more treats using these two favorites. In a medium mixing bowl, add together flour, baking powder, baking soda, pumpkin pie spice and salt. Whisk ingredients together. In the bowl of an electric mixer, add butter, sugar and brown sugar and mix on medium speed for about 3 minutes. Mix in egg and reduce speed to low. Gradually add pumpkin and Biscoff spread and mix until well blended. Add flour mixture and mix until combined. Prepare a baking sheet by placing parchment paper on the pan. Using a cookie/ice cream scoop, drop the cookies onto the cookie sheet. Bake for 13-15 minutes. Cookies will be soft to the touch. Let cool on sheets for 5-10 minutes then transfer to a wire rack to cool for 5 minutes.